Get your hands on the Avid Transit Extreme Barrow at this year’s Big One Show. 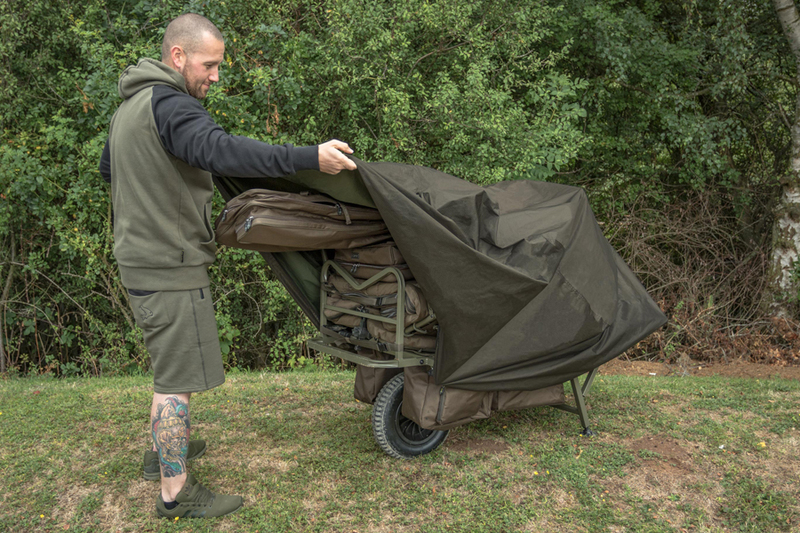 There is a definite trend for carp barrows to be more accessible from all angles, and this new one from Avid certainly fulfils that brief. If your kit is piled high, but you want to quickly get at something at the very bottom you still can, thanks to a handy slide-out tray underneath the main frame. The two pouches that sit either side of the wheel can also be unzipped from the side for easy access. A big selling point for this barrow is the ability to put your bedchair beyond the front wheel and strap it in place to really aid weight distribution. Believe us, it makes a bit difference to how much effort is required to push your gear. The side arms also articulate very neatly, allowing you to transport some seriously wide loads if required. There are plenty of different options with the side arms, so you can get your own setup just right. A new Dura Stop barrow cover, using Avid’s beautiful new honeycomb waterproof material, is available separately for £44.99. Yes, we’ve seen slide-out trays and front-mounted bedchairs before (the Trakker Access barrow is very similar indeed) but this is competitively priced at under £220 and feels well made – not something that we’ve always been able to say with Avid barrows. The proof will be in the abuse. We look forward to offering a long-term report on the Transit Extreme.